HOLD UP! I made this first with a blind-baked shortcrust pastry. It was good, but took ages to make. I occurred to me it would be both better tasting AND easier to make with a crumb crust. I did a couple of tests and it was SOOOOO much yummier. So this is the new improved recipe. A traditional American dessert pie, that is essentially a richly spiced deeply flavoured custard tart. I’ve added a light lemony cheesecake topping. 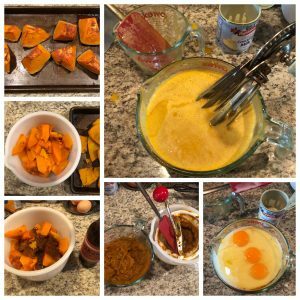 Bake pumpkin with a little sugar & spice until tender. bake at 175c for about 60 mins until very tender when tested with a sharp knife. Make a crumb crust and chill to firm. crush or process the Speculaas cookies to a fine crumb, then add the walnuts and butter and mix with a wooden spoon. Don’t do this in the food processor or you’ll lose the wonderful texture of the walnuts. Use a loose-bottomed cake or pie tin, or a spring-form pan, and lightly butter it. If you don’t have one of those, line your tin with baking paper instead and leave some overhang so you can use it to lift the pie out later. 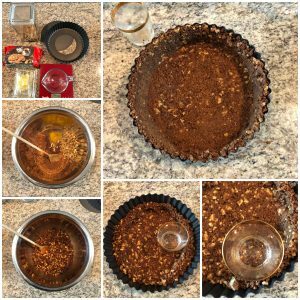 pour the crumbs in, then use a smooth-bottomed glass to press the crumbs evenly across the bottom and edges of the tin. carefully put the tin in the freezer of the fridge for the crust to firm up while you make the pumpkin filling. 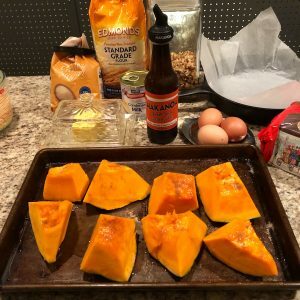 skin the cooked pumpkin and cut into into chunks, then add 3 TBSP of Hakanoa Golden Latte syrup, and process to make a puree. Push the puree through a coarse sieve with a spatula or pass through a food press, to remove any coarse fibres and lumps. A smooth puree is essential for a good pie. Add 1 x can (395 grams) of sweetened condensed milk and 3 eggs, and 1/2 tsp salt, and beat until you have a smooth golden liquid. Bake low and slow, then allow to cool. Lower the oven temperature to 160c. 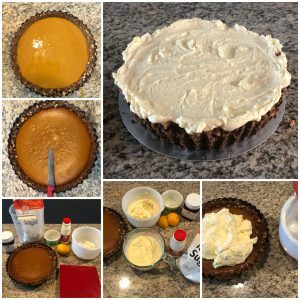 Put the pie in the oven – be very careful not to spill any! Bake for 50 to 60 mins, until a sharp knife inserted halfway between the middle and the edge comes out just clean. There should still be a bit of wobble in the middle of the pie. Remove from the oven and allow to cool in the dish. Make cream cheese topping, chill before serving. Beat together 250 grams cream cheese, juice of 1 ripe lemon, 1 tsp vanilla until smooth. In a separate bowl, beat together 250mls cream & 100 grams icing sugar until soft peaks form. Fold the whipped cream into the cream cheese until well amalgamated and smooth. Spread evenly across the top of the pie, then chill for at least an hour before serving. 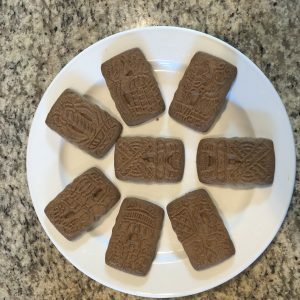 1 packet Speculaas biscuits – AKA Dutch Windmill Cookies. Most supermarkets have them in the international section – they come in a big red packet.